The Naseby Battlefield Project has created a battlefield trail which will take you to all the key parts of the approach, the battlefield itself and the Royalist retreat. At each of these spots shown on the below map, there is at least one information panel and where possible a viewing platform, to give you the best possible view of the terrain. Please move your mouse over the map for information and for more audio clips about the battle. South of East Farndon, west of the road to Clipston. Car parking, coach turning and parking space, viewing platform with wheelchair access and interpretation board. Trees and shrubs appropriate to the area have been planted. On the morning of 14 June 1645 King Charles and Prince Rupert brought the royal army up from Market Harborough to this position on the ridge between East Farndon and Little Oxendon by about 8.00am. The position was secured to the east by a thick hedge at Little Oxendon, and by steep drops to the west and north, down to the Welland valley. It was strong for static defence ‘a position of very great advantage’ but poor for tactical movement. The view to the south differs today with the building of the A14 road, the communications mast next to it and the addition of a spire to Naseby church tower. More importantly, trees, woods and enclosure hedges have been planted. The landscape of 1645 had a few parish boundary hedges and very few trees. Rupert was unable to see Fairfax’s army at Naseby windmill (now the Obelisk) because it is beyond the higher ground of the ridge on the horizon. Francis Ruce carried out a scouting reconnaissance to locate the enemy, but reported ‘With a lie in his mouth’? that he had found nothing. When Fairfax ordered the move westwards his army marched over the ridge into view. Rupert saw them and immediately hurried his troop’s south-west to meet them across Broadmoor, between Naseby and Sibbertoft. West of the Naseby to Sibbertoft road, north of the A14, as shown by brown signs. Lay-by. No purpose-built wheelchair access, but ground negotiable in good, dry weather. Interpretation board and board with reproduction of engraving of Streeter’s 1647 picture diagram of the battle. The Royalists were deployed on Dust Hill, across the valley to the north, while the Parliamentarian troops were drawn up south of the monument just south of the top of the hill and out of the sight of a person standing at this place. This area was mostly open ground, but contained by an ancient parish boundary hedge around Sulby to the west (hard to see from here) and a rabbit warren (on today’s Lodge Hill, two fields beyond the road) and boggy ground to the east. Lieutenant General of Horse Oliver Cromwell put dragoons behind Sulby Hedges. Their musket fire caused the royalist cavalry on the western flank to charge, forcing many of parliament’s horse to flee. To the west of the monument the ground rises and then falls away for a stretch, making a little valley in the face of the slope occupied by parliament forces. The royal foot attacked and were concentrated into an arrow formation by the little valley so that it almost broke through Fairfax’s line. Reserves thrown in stubbornly resisted. Cromwell’s troopers routed the horse opposing them and then fell on the left flank of the royal foot, cantering through the site of the monument to do so. The royalists began to retreat and to surrender. 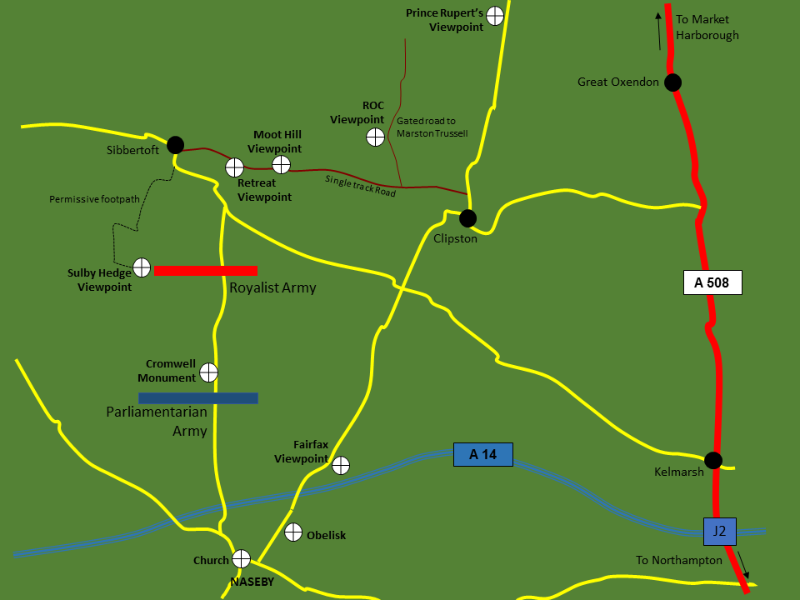 Despite Rupert’s Bluecoat Regiment ‘standing like a wall of brass’ on the slope just west of the road to the north, Fairfax’s counter-attacks succeeded in driving the royalists back. Part of the royal army went on fighting; all the way they had come that morning, in a battle reaching a climax on Wadborough Hill. From the Reservoir parking place Moot Hill is to the north with woods on the side running down to the valley beyond. The next hill to the east (right) is Wadborough, where the final stand was made by royalist soldiers. From the Royal Observer Corps lookout the full sweep of the day’s battle can be appreciated. To the north-east Rupert’s Viewpoint can be seen near East Farndon. Turning clockwise, the communications mast next to the A14 stands on the skyline and further right Fairfax’s Viewpoint. The spire of Naseby Church projects from behind a clump of trees and then the white bulk Mill Hill Farm appears. Woods obscure a view of Broadmoor, but then Lowe Farm, opposite the Reservoir parking, shows and to the right of that a lone tree stands on Moot Hill with the woods to the right of the open field. The stand on that hill continued until their comrades had established themselves on the nearer hill, Wadborough. Then the defenders of Moot Hill turned and ran for their lives, down the slope into the valley and up to their new position to continue the fight. How long they held out on Wadborough is impossible to say, but eventually they could stand no more and they fled down the slope to the right, still turning and resisting from time to time. The lucky ones, mostly horse, made it to Leicester. In the park, near the junction of the A4303 and the road to East Farndon. Wheelchair access and interpretation board. In the early hours of 14 June 1645 royalist forces marched towards East Farndon to meet at the church, which stood out clearly on the treeless hill. From there they were directed to their positions across the hillside south of the village. Many of them passed along this road, crossing the river here by a ford. At the close of the battle, from the heights of the hills south of the Welland valley, Royalist troops fled, pursued by Parliamentarian horse. Some rode east or west of Market Harborough and others made direct for the town, as did King Charles and his personal staff. As they got back here, to Bloodyman’s Ford, a troop of Parliamentarian horse threatened to cut them off. A contemporary account says: The King himself in person being necessitated, with his own troop only, to charge through the body for his escape and it is said that his flight was aided by a gentleman of the Bedchamber, that stood next the King, and cryed, ‘Hold your hands! The King will yield his person!’ Which while they did, he got away and so escaped. Please note that there is limited parking, and in parts, single track roads, So caution is advised when driving or walking the battlefield. It is possible to enjoy a visit without any reference material, however, to get the most out of the experience it is suggested that Ordnance Survey maps are taken. The 1:25,000 Explorer 223 is ideal covering the entire area of operations of 14 June 1645 as well as a good deal of the terrain over which the armies approached and departed, from Market Harborough in the north to Northampton in the south. Alternatively, two of the 1:50,000 Landranger maps are needed if wider coverage but less detailed scale is wanted. Numbers 152 and 141 deal with the southern and northern sectors respectively. A pair of field glasses or binoculars will be useful to identify features at a distance. If leaving the car to walk, even the short distance between the lay-by and the Cromwell Monument on the Naseby to Sibbertoft road, be sure to lock it and secure or cover up any valuables.